pH is a measurement of the acidity of a solution, such as aquarium water. The pH of natural seawater ranges from approximately 8.2 - 8.4, however maintaining pH in the range of 8.1 - 8.5 on a daily basis has no negative impact on captive marine organisms. To maintain stable pH within the desired range, the alkalinity should be maintained within a range of 7 - 12 dKH (2.5 - 4.3 meq/L). Aquaria with low circulation at the water’s surface, in which a CO2-injected calcium reactor is being employed, or in which a carbonate-deficient sea salt blend has been used, often have depressed pH. pH+ will bring pH in the aquarium back into the desired range. Use as directed and do not exceed a pH value of 8.5, as this pH may be stressful and/or fatal to sensitive aquarium inhabitants. 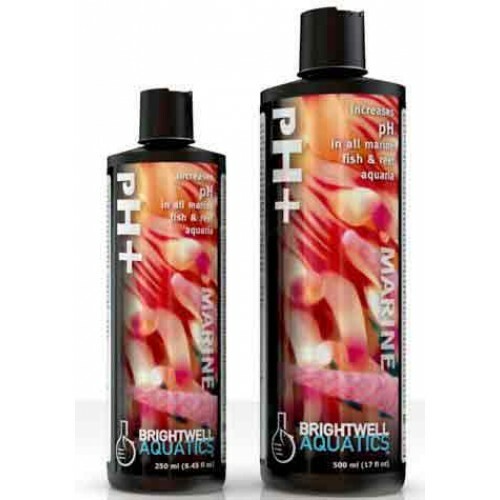 Additionally, changes to pH should be made very gradually, again to avoid stressing aquarium inhabitants. It is not unusual for pH to fluctuate throughout the course of 24-hours between seemingly wide-ranging values (i.e. 8.1 at night to 8.4 during the middle of the day); this is a natural occurrence that is caused by changes in the rates of photosynthesis between dark and light periods. This situation is frequently encountered in aquaria with considerable growth of macroalgae (in the display aquarium or in a refugium). One proven method of minimizing this daily pH-fluctuation is to implement a refugium that is illuminated on an opposite schedule to the lighting for the display aquarium (known as reverse-daylight photosynthesis). In this method, the refugium is illuminated at night when the display aquarium lights are turned off, and vice versa; a 1-hour overlap of having all lights on encourages a smooth transition and little change in pH. The result is that photosynthesis takes place 24-hours a day and keeps pH as stable as can be managed. If pH levels are seen to be constantly below the desired level and alkalinity is within the proper range, increasing the circulation of water near the aquarium surface will often produce positive results; this practice increases the rate of gas exchange and encourages entrained CO2 to exit the aquarium before it has a chance to form the weak acids responsible for low pH and depletion of alkalinity. Add this product at the maximum dosage of 5 ml per 20 US-gallons per 24-hours at the same time each day. pH will generally stabilize within 2 hours following product use, however livestock should not be subjected to a change in pH of more than 0.2 per 24-hour period, so do not overdose pH+. Repeat as needed to attain desired pH value. It is recommended that pH be maintained within a range of +/-0.2 at all times.